Why Should I Care about a Winter Travel Management Plan in California? The first Winter Travel Management Plan happened in Lassen National Forest. Though it is still being finalized, it is clear that motorized users are losing thousands of acres of their land. While we at Share the Slate certainly recognize the need for quite-use areas, the overall Winter Travel Management Plan was hugely skewed toward non-motorized designations, rendering huge swaths of land virtually inaccessible in winter except to the most elite human-powered users. We cannot let this be the standard for all Winter Travel Management Plans to follow. Helping to preserve multi-use areas and winter access in the Sierras will help preserve them in our own Colorado backyard as well. For more info on Lassen National Forest Winter Travel Management, see this Environmental Impact Statement as well as the forest service page. 1) Take a look at the draft proposal (DEIS) for Winter Travel Management in Stanislaus National Forest. You will find a brief overview of the “Alternatives” starting on page xi (which is actually page 13 in the PDF). It’s a huge document – just get a basis for the alternatives. Remember that Alternative 2 is no action and that Alternative 5 is the actual preferred action. View he maps for Alternative 2 and Alternative 5 for comparison. 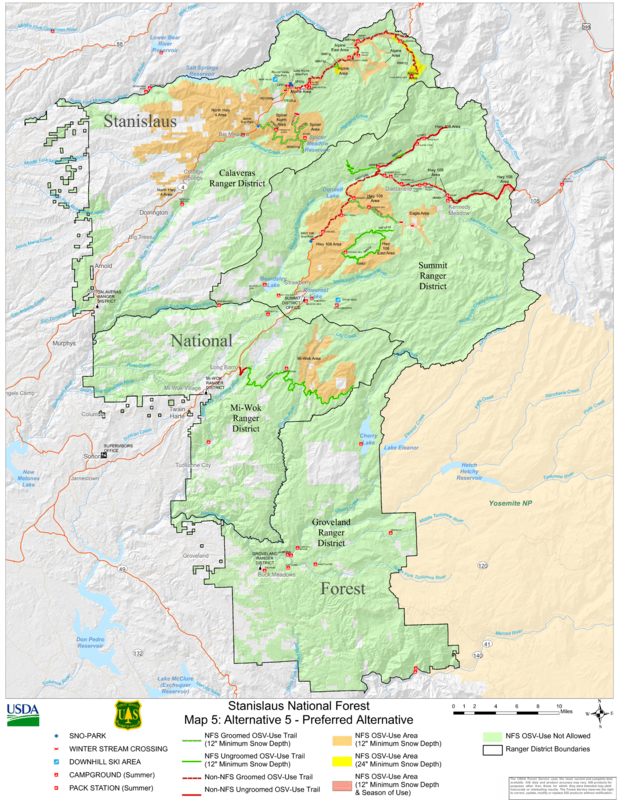 More info and maps can be seen on the Forest Service page, just click on the “Analysis” tab. *The Stanislaus National Forest (SNF) is undergoing a NEPA analysis to designate trails and areas for OSV (Over Snow Vehicle) use. The recently released DEIS, linked above, is the second significant phase of this process, and is open for public comment. * Is the SNF just going to choose one of the alternatives? Maybe. To give an example, our own Gang of 9 Decision is basically an alternative from an FEIS. As it is, they are choosing Alternative 5. However, in the only OSV managment example we have so far from the Lassen National Forest, a hybrid mix of alternatives was chosen. This is why your comments need to be specific about certain areas. They matter. * The preferred Alternative 5 is unfairly skewed toward non-motorized designations. The purpose of a Winter Travel Management Plan is to regulate OSV travel in a fair and balanced manner. It should be an OSV management plan, not a non-motorized enhancement plan. Alternative 5 is not a balanced use model for winter recreation. Your comment could even mention that they go back to the drawing board to create more realistic and balanced use models. * Explain that many people use snowmobiles and other OSV’s to access areas which ultimately result in quiet use – aka, backcountry skiing and snowboarding. Many areas would be basically unreasonable to access without motorized assistance. * Great non-motorized areas already exist close to parking areas. Carson-Iceberg Wilderness sits only a mile away from the Lake Alpine Snopark parking lot. The meadow across the street from the town of Bear Valley offers great non-motorized recreation in a tame environment. Both Mokelumne and Carson-Iceberg Wilderness areas are accessible within only a few miles from multiple parking areas. Areas that are farther from trailheads are better accessed using motorized methods. Keep most of these hard-to-reach areas open so we can enjoy them! * In order to prevent resource damage, the SNF is proposing a variety of minimum snow depth requirements. If you know snow, you’re well aware that not all snow is equal. Ice, powder, sun-baked, this is far too ambiguous a measure. Mention that in your comments. Snowmobiles don’t go very far on dirt before melting the hifax and overheating. Remind the Forest Service of this. Minimum snow depths aren’t necessary. We suggest the following definition be used in lieu of a hard number: Adequate snow cover is defined by a layer of dense, packed snow, or deeper fresh snow sufficient to support your vehicle, and prevent damage to forest resources. *The Stanislaus planned for the area around Eagle Meadows, Pacific Valley, and a small area on Sonora pass along the Nightcap Ridge to be “Near Natural, non-motorized” in during their overall Forest Plan in 1991. However, this was never actually implemented, though the closure is included in the preferred Alternative 5. These have been popular riding areas both before and since 1991. Fortunately, the Forest Service acknowledges this. They have indicated a willingness to revise this designation because it would be difficult to manage as this designation originally intended. The 1991 non-motorized designation is a holdover from summer management. Snowmobiles don’t require roads or trails and have no effect on the permanent landscape. Ask them to create a new designation that allows winter time motorized use! A WINTER SPECIAL MANAGEMENT AREA. *Preferred Alternative 5 has confusing boundaries. Boundaries should be easily distinguishable using roads, creeks, ridges or other significant features to avoid confusion. Most of Wilderness boundaries are based on this topographic sense and OSV management should follow suit. snowmobilers drive up the pass once it’s open to ride this zone. NO CLOSING DATE ON THE PASS. riding the hill after the ski area closes. Let the Stanislaus know! * Be SPECIFIC! Use names and examples. Talk about historical use. Cite page numbers and references. * Never ask why, never ask how. Asking questions will give the give the Forest Service the opportunity to provide answers, but not a change the document. Visit the Sierra Snowmobile Foundation website for more resources and specific ideas for comments. Also, keep in mind that Winter Travel Management Plans are under way in Eldorado and Tahoe National Forests as well. We will keep you informed of action needed, but their website provides valuable information. Share this post through email and social media! Follow Share the Slate and follow Sierra Snowmobile Foundation on Facebook to stay informed!